Deficiency Zero Theorem (Baby Version). Suppose we have a weakly reversible reaction network with deficiency zero. Then for any choice of rate constants there exists an equilibrium solution of the rate equation where all species are present in nonzero amounts. A ‘stochastic’ particle is one that’s carrying out a random walk, and now describes its probability to be somewhere, instead of its amplitude. where is some matrix, and is defined using a new thing called ‘matrix exponentiation’, which makes the equation nonlinear! If you’re reading this you probably know how to multiply a vector by a matrix. But if you’re like me, you’ve never seen anyone take a vector and raise to the power of some matrix! I’ll explain it, don’t worry… right now I’m just trying to get you intrigued. It’s not complicated, but it’s exciting how this unusual operation shows up naturally in chemistry. That’s just what I’m looking for these days: new math ideas that show up in practical subjects like chemistry, and new ways that math can help people in these subjects. This equation is linear, so it’s easy to understand. This is a nonlinear problem involving matrix exponentiation, but still, we can do it, using a clever trick called ‘logarithms’. That’s a rough outline of the plan. But now let’s get started, because the details are actually fascinating. Today I’ll just show you how to rewrite the rate equation in this new way. • a one-to-one map saying how each complex is made of species. However, we’ve now switched to thinking of our set of complexes as a set in its own right that is mapped into by This is good for lots of reasons, like defining the concept of ‘deficiency’, which we did last time. But it means the rate equation above doesn’t quite parse anymore! Things like and live in ; we need to explicitly convert them into elements of using for our equation to make sense! This will seem perfectly natural when we continue our study of circuits made of electrical resistors, and if you’re very clever you can already see it lurking in Part 16. But never mind. The only thing I haven’t defined yet is the funny exponential That’s what makes the equation nonlinear. We’re taking a vector to the power of a matrix and getting a vector. This sounds weird—but it actually makes sense! The entry says how many times the th species shows up in the th complex. It’s exactly the same, but with multiplication replacing addition, and exponentiation replacing multiplication! Apparently my class on matrices stopped too soon: we learned about matrix multiplication, but matrix exponentiation is also worthwhile. say roughly how many ways you can build complex 1 by picking things of species 1, things of species 2, and so on. Why ‘roughly’? Well, we’re pretending we can pick the same thing twice. So if we have 4 water molecules and we need to pick 3, this formula gives The right answer is To get this answer we’d need to use the ‘falling power’ as explained in Part 4. But the rate equation describes chemistry in the limit where we have lots of things of each species. In this limit, the ordinary power becomes a good approximation. Puzzle. In this post we’ve seen a vector raised to a matrix power, which is a vector, and also a vector raised to a vector power, which is a number. How are they related? So, we’ll compute and think about the meaning of each quantity we get en route. This is a vector in It’s a list of numbers saying how many ways we can build each complex starting from our raw ingredients. In the first step here, the factor of in the cleverly chosen inner product canceled the visible factor of For the second step, you just need to think for half a minute—or ten, depending on how much coffee you’ve had. In other words, is a linear combination of transitions, where each one is weighted both by the rate it happens and how many ways it can happen starting with our raw ingredients. Our goal is to compute We’re almost there. Remember, says which complex is the input of a given transition, and says which complex is the output. So, says the total rate at which complexes are created and/or destroyed starting with the species in as our raw ingredients. to take a bunch of species and work out how many ways we can build each complex from them. 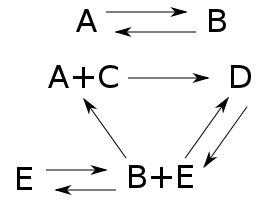 There is much more to say about this: for example, these maps arise from a pair of what category theorists call ‘adjoint functors’. But I’m worn out and you probably are too, if you’re still here at all. • Jonathan M. Guberman, Mass Action Reaction Networks and the Deficiency Zero Theorem, B.A. thesis, Department of Mathematics, Harvard University, 2003. I urge you to check it out. In particular, Section 3 and Appendix A discuss matrix exponentiation. Has anyone discussed this before? • Jeremy Gunawardena, Chemical reaction network theory for in silico biologists, 2003. • F. Horn and R. Jackson, General mass action kinetics, Archive for Rational Mechanics and Analysis 47 (1972), 81-116. • Martin Feinberg, Lectures on reaction networks, 1979. If you’ve seen other proofs, let us know. This entry was posted on Thursday, August 16th, 2012 at 5:45 am and is filed under chemistry, mathematics, networks. You can follow any responses to this entry through the RSS 2.0 feed. You can leave a response, or trackback from your own site. As to the puzzle, the vector raised to a matrix power appears to be a vector of vectors raised to vector powers, namely, the base vector raised to each column of the matrix in turn. Is that all you’re getting at, or is there something deeper? That’s good for starters, but there’s something else to say, which is even ‘better’. Still, you get the prize for being the being the only person in the world to have read this post. I found this post to the most exciting one to write so far, but that’s always dangerous. In school, I’ve noticed that when the teacher gets interested in what they’re saying, the class gets lost or bored. So my usual rule for teaching is: don’t focus on what you’re saying, focus on how you’re saying it and how people react. But I broke that rule here because I’d just understood a bunch of new stuff. Okay, well, I’ll take another stab at it then. If you think of vectors as column vectors (i.e., as matrices) then the two definitions coincide (assuming you identify vectors with numbers), so that raising a vector to a vector is a special case of raising a vector to a matrix. Am I getting warmer or colder? And I enjoyed this post very much. I just need to chew on it a while longer. Hopefully I’ll be able to find the time. Speaking of which, I have a (possibly silly, ill-posed, not well-thought out) question. I haven’t been able to keep up with this series as closely as I’d like, so it may have been discussed in one of the earlier posts, but here goes. If I think of the stochastic reaction network as a stochastic Petri net, is the adjoint of the map introduced here related to some kind of Fockification (maybe something akin to the functor in Reed and Simon that I vaguely recall from another life) that gives rise to the appropriate powers of raising and lowering operators we saw so much of in the earlier posts? Hopefully that makes some kind of sense…. If not, I’ll think on it some more and try to ask a better question. On further reflection, that question is overly convoluted. So, let me try a simpler version: Where are the raising and lowering operators hiding in this formalism? Is it another map that isn’t present here or do they arise from one of the maps you’ve introduced (or perhaps a composition of some of the maps you’ve introduced)? I’ll make the trivial observation that raising a vector to a vector can be regarded as looking at what the “projection” of raising the vector to a matrix with that as one of the columns along that basis. So in particular, one can imagine a “spectrum” of exponentiaions ranging from along one basis dimension (ie, result complex) trhrough subsets of the resulting complexes (using a sub-matrix formed from the columns) ending up at the exponential using the full matrix (ie, accounting for all the complexes generatable). At this point, my mind reaches for the standard tools for understanding linear algebra, namely the singular value decomposition. This talks about how any matrix linear transformation can be decomposed into a sum of its actions on an orthogonal basis. If we were to look for some similarish decomposition of the matrix that would still tell us something about the result of the nonlinear vector exponential….? That’s the answer I was fishing for: when you raise a vector to a vector power and get a number, it’s a special case of raising an matrix to the power of an matrix and getting an matrix. Just take . It just like how when you take the dot product of two vectors and get a number, you can see it as a special case of matrix multiplication. Think of the first vector as a row vector: a matrix. Think of the second vector as a column vector: a matrix. Multiply these matrices and presto, you get a matrix, or number. Of course later, when we get sophisticated, we like to think of column vectors and row vectors as living in dual vector spaces, not the same vector space, and then this operation is called, not the ‘dot product’, but the pairing between a vector and a dual vector. But never mind: all that sophisticated stuff is designed to ultimately make things basis-independent, but matrix exponentiation definitely does depend on a choice of basis. That’s okay, because our vectors here are really functions on a finite set: the set of complexes, say, or the set of species. So, we have god-given bases, and we get to use them. Where are the raising and lowering operators hiding in this formalism? If you watched the earlier episodes of this show, you know that raising and lowering operators, and Fock space, are extremely important in studying the master equation for a stochastic reaction network (aka stochastic Petri net). But now we’re talking about the rate equation. This is like the ‘classical limit’ of the master equation, or more precisely its ‘large number limit’. The master equation is all about the probability that we have some number of things of each species. These numbers are natural numbers, so they jump discretely… but we only know the probability that these numbers are this or that, and these probabilities vary smoothly with the passage of time. The rate equation is all about the number of things of each species. Now we act like we know them for sure, and that they’re positive real numbers, and that they vary smoothly with the passage of time. That’s all fun… and we can rigorously derive the rate equation from the master equation in a certain limit where there are large numbers of things. But in Part 23 we’ll see an amazing extra twist! In our quest to prove the deficiency zero theorem, we’ll introduce another master equation, which describes a Markov process on the set of complexes (which are bunches of things of our various species). The dynamics of this Markov process are in general different than that of the rate equation… but we’ll get equilibrium solutions of the rate equation from equilibria of this Markov process! Operators like and play a huge role in constructing the Hamiltonian for this Markov process on complexes. But they are not, as far as I can tell, directly related to operators on the Fock space we saw earlier. But of course, this is the sort of thing I’m still busy trying to understand. By the way, any Markov process gives rise to a stochastic Petri net of a special sort, where each transition has just one input and one output. The space of states for the stochastic Petri net is the ‘Fock space’ of that for the Markov process. In other words, the space of states for the Markov process is the ‘single-particle space’ of the space of states for the stochastic Petri net. And here’s what you’ll like: time evolution for the Petri net is obtained by applying Reed and Simon’s , or at least its stochastic analogue, to time evolution for the Markov process! I’ve been meaning to talk about this for a long time. But this is not one of the games I’m playing right now. Thank you for the detailed reply to a very vague question. It hit exactly on what was confusing me, namely, the you introduced above is (in retrospect, obviously) different from the hamiltonian that gives rise to the Master equation that the rate equation is a large number approximation for. But of course, the danger of a detailed reply is that it often raises other questions that can get you off topic. So, rather than ask an off topic question, I’ll just put in a request: I’d love to see the rigorous proof showing the rate equation as the limit of the Master equation. Defining , using some notation from a ways back, it’s straightforward algebra to show that the Master equation implies something very much like the rate equation, only with falling powers in place of ordinary powers. And intuitively, for large N those are the same. But from there, I’m not sure what sort of convergence to try and whether I need to make additional assumptions, like possibly a condition on the variance of ? Yes, that’s something that’s missing in these posts, which really should be included. I haven’t actually written up such a proof, and I haven’t seen one anywhere though it seems like an obvious thing for people to have studied. You sketched the basic idea quite nicely—and based on that idea, my ‘analysis brain’ feels completely confident it can jump in and supply all the necessary epsilons and deltas, and hypotheses, that will lead to a nice theorem. Getting the strongest possible theorem would be hard! Getting a theorem that illustrates the idea should not be hard. But I won’t try to do it now… that’s more like a blog post on its own, and one that will take about a week to write. A crucial point is that the solution of the master equation will only be close to that of the rate equation if the ‘spread’ of the probability distributions of the numbers of particles of each species is sufficiently small, as well as their means being large. However, as time passes, the spread will tend to grow. So, the rate equation will only be a good approximation to the master equation for a certain amount of time, not forever… except in certain very special cases. For example, there are stochastic reaction networks whose rate equations have periodic solutions which never approach any sort of equilibrium. However, the solutions of the corresponding master equation will probably ‘smear out’ and approach an equilibrium, at least in many cases. I’m not sure what sort of convergence to try and whether I need to make additional assumptions, like possibly a condition on the variance of N? You certainly need something like that, but probably more. I did a bunch of calculations at one point and it seems I needed not just bounds on the variance but also the higher moments. Basically the trick is just to calculate the difference between what you want and what you’ve got, and see what’s required to make that be small! I read it! I just don’t have anything all that interesting to say. I read it too — But not carefully enough to understand what it is that I don’t understand. Okay. If you have any questions, don’t be shy. The series is building up to a climax: in Part 24 I’ll prove the deficiency zero theorem, or at least the part of it that I want to prove. But as usual in math, this climax involves putting together lots of ideas that were discussed earlier… and as usual in math, most people will be left scratching their heads and wondering what just happened. At least in a blog, unlike a textbook, one can ask questions or complain. Puzzle: if I see things correctly, as you say a vector raised to a vector power gives you a number, which is similar to a dot product, while a vector raised to a matrix power, gives you a vector, which is similar to a vector (external) product, since the dimensionality can be whatever you want. But there is something more I think that goes around here, I think. In fact, let’s assume that you choose a square matrix so that the initial vector and the final vector both live on the same space, then I’d guess you may find a bunch of matrices which leave the initial vector unchanged up to an overall constant. This is like an eigenstate/eigenvector of the matrix power operator, and the whole story looks like a generalization of the usual ‘linear’ version of it, very common in linear algebra or quantum mechanics. You can find your projectors, orthogonal spaces, and so on, and even do a little group theory using matrices that will switch around components of the initial vector and so on. I’m too tired right now to actually try, but it seems very intriguing since the generators of the typical groups (rotations etc) must have the same algebra by definition but I think will have a different form, since the way the algebra acts on them is not the usual matrix multiplication but this power multiplications. It would be fun to see how this generators relate to the ‘linear’ ones. In some sense the S matrix in particle physics represents all the possible interactions between an initial and a final state, and now I’m starting thinking whether this formulation could be useful in physics in general or at least in cosmology before the last scattering or so, when all the fundamental interactions may look more like chemistry. Maybe I’m really to tired hahaha, anyhow I hope I’m not seeing ghosts here, and thanks a lot for the very cool post! This is like an eigenstate/eigenvector of the matrix power operator, and the whole story looks like a generalization of the usual ‘linear’ version of it, very common in linear algebra or quantum mechanics. and use it to reduce a problem involving to a problem involving ordinary matrix multiplication. Anyway, this means that tools developed for matrix multiplication can be applied to matrix exponentiation. Over on Google+, I admitted that with matrix exponentiation as defined here, needn’t be an identity matrix. I don’t really care what this operation is called: what matters is its applications to chemical reaction networks. Here is a vector with components, which we can think of as a matrix. is an matrix, is the matrix given by matrix exponentiation as defined in this paper, and is given by ordinary matrix multiplication. The reason this is important is that a list of concentrations of chemicals can be seen as a vector with nonnegative (and often positive) components. But I also like this kind of matrix exponentiation because it arises from the usual concept of an ‘exponential object’ in category theory. In this article, if we reversed the directions of s, t so that , then wouldn’t the new rate equation even more resemble the master equation, i.e. ? Also, am I right in concluding that we rewrote the rate equation to have a complex based definition rather than a transition based definition as before, perhaps because the ACK and the deficiency 0 theorems have conditions involving complexes in their statements?